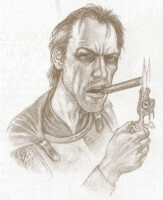 Samuel Vimes was in charge of the night shift of the City Watch, a job that largely involved gettting drunk and keeping out of trouble. However,w ith the arrival of Carrot, he has found himself called upon to straighten up and actually take command. Since then, he has risen to become the Commander of the City Watch. He is of the opinion that everyone is guilty of something, even if they haven't done anything yet. Bob Hoskins, Jack Dee, Windsor Davies, Clint Eastwood, Ben Kingsley, Danny Glover, Val Kilmer, Tim Roth, Anthony Hopkins, Sam Neill.